How big is the blogosphere? In April the blog search engine Technorati reported that it was tracking 70 million blogs, with 120,000 new ones arriving every day. In such a huge universe, the signal-to-noise ratio is bound to be daunting, but we'll share with you the ones we've found worthy. In compiling our list, we realized that reasonable men and women may disagree on the definition of a blog. 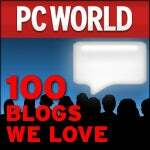 For example, we quickly discarded the notion that a blog must be the work of an individual: Some of the best, including--and we hope you'll agree--our own Today @ PC World, are the work of many people. But we all agreed that a good blog has at least some element of voice: The people who write it express an opinion in the words they write and the images they include. Of course, lots of the blogs we read deal with technology. But hey, we have personal lives, too. We like the recipes at Slashfood, the animation at Cartoon Brew, even the adorably over-the-top photos at Cute Overload. Know a gem of a blog that we missed? Let us know in the comments below. We're always ready to expand our reading.